I started a newsletter about four weeks ago and never officially introduced it in my blog. I left it as a side note on a post or two ago and put in in the About section as well. I’ve been screaming my lungs out on Instagram and force adding my friends and family to the mailing list, in the hope that I won’t be shouting into an empty space, like writing for this blog makes me feel sometimes. I’ve been doing this for more than a couple of years now and it’s only recently that I’ve noticed engagement – actual engagement with what I share. I’ve had a reader invite me to visit her in Victoria BC (Hi Ruth!) and I had a fellow RCRC volunteer ask me about a recipe. I knew of her but never officially spent volunteering time with her or introduced myself until this summer. It’s nice when people other than your mother read and share what you put out into the world. These recipes I write are mere tools and inspiration to get people cooking because it really is so easy. I’m not an expert but when I find an interesting flavour or technique, I like to share it. I believe we all know the best way to feed ourselves and even if that’s a bag of chips or a bucket of fried chicken, that’s a choice you get to make as an adult. Do it for you. As for the photos, I have begun to draw out how I want my photos to look before I make them. Most of them don’t follow the sketch but I notice I feel a lot calmer when I have an outline to work with. My inner critic is a lot quieter when I have a draft and I can do what I need to without putting myself down. It’s also taken a lot of confidence to share my simple style of cooking and I’m finally comfortable with my ideas. While they are easy to execute, there is a complex personality to them (ME) and I’m better at owning that. That is probably what is shining through. Is it weird to be proud of myself? The newsletter is the best next step for me. I crave that connection when I write and as this blog evolves, I know I want to get to know my regular readers better. I am still trying to figure out how to set the newsletter apart from the .com. I’m hoping to cover more identity, food matters, entrepreneurship, literary topics and it would be awesome to have you along as contributors and readers. I’d love for you to read what I’ve put out so far and send me feedback or just say hi. If you’d like to discuss ideas, email me and we can set the ball rolling. Here’s the link to the newsletter. I didn’t know whether to link it to “the link”, “Here’s” or “newsletter” so I did it for everything. To those who’ve voluntarily subscribed already, THANK YOU SO MUCH. You kill me, not literally. Any fresh fruit or ready-made granola or yogurt will work in this recipe. I’ve posted this recipe for those who’d like to try making granola on a stove. A majority of homes in India don’t have ovens and toast all their grains and spices on the stove. This felt natural. As for the yogurt, if you’ve not heard of shrikhand, this is an introduction to it. Whenever I ate it, I could only manage a spoonful. It was too sweet for me and never sour enough. What I loved was the creamy, spreadable consistency – something you get by separating the curds from the whey. Shrikhand is traditionally flavoured with cardamom and sugar. To make it fancier, crushed almonds or pistachios and saffron may be added. It’s sometimes served with mango (amrakhand) and hot puri. In case you were wondering, it’s a dessert popular in the west Indian states of Maharashtra and Gujarat. Line a fine mesh strainer or colander with a double layer of muslin/cheesecloth and place over a large bowl. Make sure the bottom of the strainer stays separate from the bottom of the bowl so the curds and whey don’t touch. You can also tie the cheesecloth into a bundle and hang it from a ladle over a bowl. The pressure will help it drain better. Let it sit in the fridge overnight until most of the whey has drained out from the yogurt and collected in the bowl below. Lightly squeeze the cheesecloth to get rid of the last bits of whey. Add the yogurt to another bowl. Save the whey for a curry/soup or discard. Using a pairing knife, split the vanilla bean in half length-wise and use the back of the knife to scrape the vanilla seeds into the yogurt. Stir to combine and set aside. If using vanilla extract instead of whole beans, add it to the drained yogurt and stir to combine. Heat a skillet on medium heat and add the oats, nuts and seeds to it. Toast them, stirring frequently until the oats turn light brown and the seeds start to crackle. This should take about 5-7 minutes. Take the skillet off the heat and add the coconut oil, sugar and salt. Toss well to coat the oats. Put the skillet back on the stove and continue to stir, allowing the mixture to turn a deeper golden colour. Do this for 4-5 minutes. It goes from warm to burnt quite fast so keep an eye on it. Pour the granola on a baking sheet and let it cool completely. You can add in coconut or any dried fruit at this point. OMG I LOVE THE GIF! So lou-ly this is yo! Home-made granola is officially the only way I can eat oats, by the bucketful. Else they’re so slimy, aaargh! 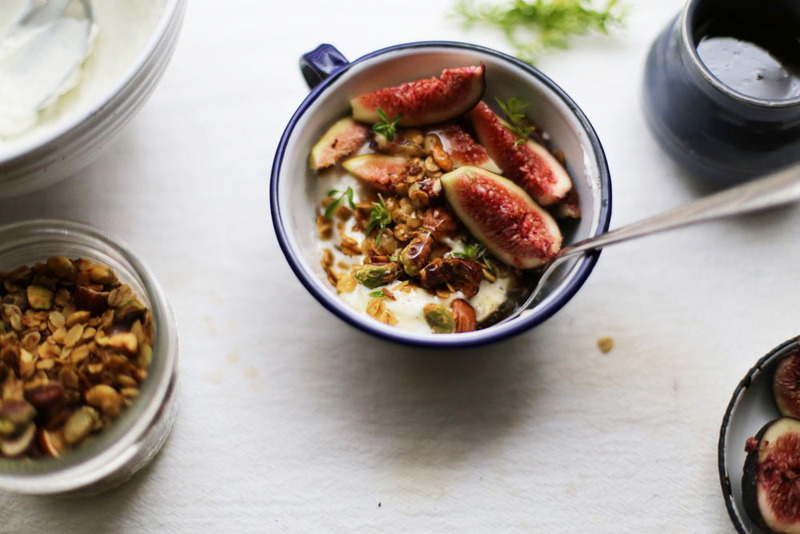 More than anything, I’m loving the flavour combinations you’ve used – fresh figs with the granola, heavenly! You’re so right. We get so many brands of granola here which are good but I can’t for the life of me get myself to spend money on something so easy to make.